Guitar Center, the trusted brand that sells a variety of music products, offers more than just gear — they offer lessons and workshops as well. Their philosophy, according to the company, is simple. They want to make learning fun while being committed to the integrity of a quality music education. In addition to learning, students are able to learn with others while gaining the confidence needed to take on new challenges. If you’re thinking about music lessons, whether it’s drums, guitars, or another instrument, Guitar Center offers studio locations throughout the United States, allowing students to be creative, all while inside of a comfortable environment. How much do guitar lessons cost at Guitar Center? According to those who took advantage of lessons at Guitar Center, the first lesson often involves meeting with your instructor, talking about your skills and goals, as well as taking advantage of a 15-minute lesson for free to see if you like both the instructor and the Guitar Center curriculum. From there, if you like what you’re seeing/hearing, then you can proceed to sign up for lessons, either in a bulk package or individually. As for fees, the administration fee to join is often $20, while the actual lessons range anywhere from $120 for four 30-minute sessions to about $250 for four one-hour sessions, and according to some instructors, while not confirmed, do note students do need to purchase a lesson pack that costs about $7 or more, depending on the instrument and material. This price can also be affected by your local geographical region. To be certain as to what your local Guitar Center will charge, call your location to know of the exact rates. This Yelp review for the Woodland Hills, California location, which is now closed, had a reviewer who claimed he paid about $30 per 30-minute lesson. Another review for the San Francisco location stated the lessons were $120 a month for one 30-minute lesson per week. What is included in the lesson fee? According to most who took advantage of the lessons, most students will meet once a week for 30 minutes with a designated instructor for one-on-one time. Aside from the one-on-one lessons, the company allows students the opportunity to take advantage of “open office” hours, where you can meet with your instructor during store hours with any questions you may have. Available in select locations, and for an additional fee, students can practice in the rehearsal rooms. This fee, according to some reviews online, stated it was about $25 per 30-minutes. Students, based on their skill level, are encouraged to also take advantage of “jam night,” which is a night where students can get together to play as a band. When a student gets good enough, the center will place you with three to five similarly skilled players to play a concert for friends and family. 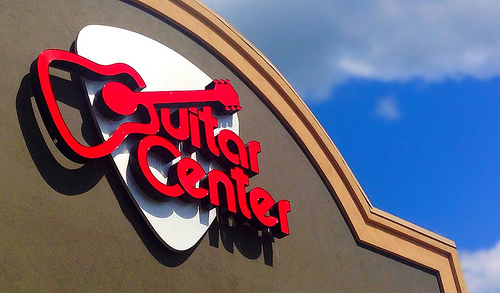 Not all Guitar Center locations will have private lessons available. To be certain your local Guitar Center has lessons available, refer to their official website search option to confirm. All instructors available are thoroughly screened via a background check and have multiple years of experience in music instructions, often holding credentials from local schools of music. The company makes sure that not only are the instructors qualified, but they are patient with their students as well. Even if you’re unhappy with your instructor, the company allows you to change to another qualified instructor at the location. Instructors who teach at Guitar Center state that you should try to take advantage of an Open House event because, during this time, they often waive the administration fee, up to $20. The company, from time to time, also offers free workshops and clinics on a variety of subjects. Remember that Guitar Center is one of the many options for those looking for lessons. Be sure to compare other alternatives to see how the value and curriculum compare, such as YouTube.com, local music shops and/or even online lessons.